It was a perfectly lovely spring day. The sky was clear—clear enough for an afternoon hike. Crisp air, cool and dry enough not to break too much of a sweat. We don’t know what the rest of the followers were doing on this particular day. They could have been visiting with others in the surrounding towns. Or maybe they went to the market. Perhaps they were taking some time to rest. What we are told is that Jesus goes for a hike with Peter, James and John, up to a high mountain. Though we don’t know which mountain it was—likely either Mount Tabor or Mount Hermon, though for what it’s worth, Mount Tabor seems to be the winner, today boasting two monasteries and the Church of the Transfiguration. It stands about 1800 feet above sea level; mountain paths twist and turn. No way around it; this was no leisurely stroll. They had been told many things. They had seen Jesus feed thousands with food enough for a young man’s lunch. They had witnessed the healing of crowds of people afflicted with leprosy, demons, blindness, deafness. They had seen Jesus walk on water, and heard his parables of faith. They had heard his warnings against false piety. All these things were still fresh in their minds, crowding their thoughts with more questions than answers. Yet they remained puzzled by what all this could mean. When Jesus invited these three on a walk I imagine them scurrying to their feet, eager for a chance to talk—really talk—with Jesus about everything they had witnessed in the recent days, especially their bewilderment over the morbid shift in Jesus’ tone. And when he told them they were going up to the mountain, they likely expected something. After all, mountains are where great and marvelous encounters with the divine happen. Far above the land of houses, and palaces, above the markets and the temples, mountain tops touched the clouds, the very dwelling place of the Most High. It was on a mountain that Moses spoke with God, where Moses saw God’s face and lived. Elijah emerged on a mountain to hear God’s voice in the thundering silence. 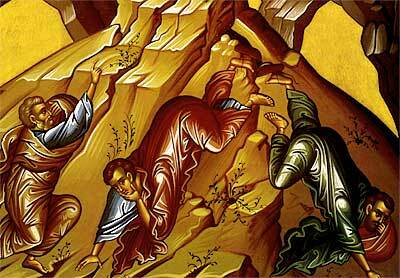 And to this mountain Peter, James and John followed Jesus, no doubt profoundly curious. The Gospel doesn’t give us any details between their ascent up the mountain and what happened next. We don’t know what sorts of conversation happened as they followed the path to the peak. Maybe the three disciples trailed Jesus asking questions of him the whole way. Maybe Jesus answered, maybe he didn’t. Maybe they remained in silence throughout their climb. I like to imagine them telling jokes, or recounting favorite memories from their journeys. What we are told is that something profoundly unearthly happened when they had reached the top. The narration we have sounds so thoroughly ordinary: “And he was transfigured before them, and his face shone like the sun, and his clothes became dazzling white.” They had just rested their feet under the olive trees, and Jesus changed before their eyes. He shone, and dazzled, and was bright white. No sooner had they adjusted their eyes to the bright light, than Jesus was accompanied by both Moses and Elijah. The passage tells us that they appeared and were talking with Jesus. Again we do not have a record of this conversation among prophets. And what does Peter want to do? He makes a very generous offer, though perhaps somewhat misplaced: “Lord, it is good for us to be here; if you wish, I will make three dwellings here, one for you, one for Moses, and one for Elijah.” He wants to stay here on the mountain, in the moment. Forget that they likely brought nothing with them. This is too good to let go of, too good to walk away from. This is holy. We should stay. Imagine all they could learn by staying on the mountain surrounded by Moses, the lawgiver, Elijah, the prophet, and Jesus, the Christ. It’s really quite understandable: Let’s sit tight. We could even move in. So what if we didn’t bring anything with us—who needs stuff when we have this view, this is a perfectly lovely place to make a home, settle in, raise a family. We don’t need to descend and risk ridicule, reputation or death. Among all this fearful chatter, God breaks though repeating the baptismal proclamation: “This is my Son, the Beloved; with him I am well pleased; listen to him!” The things Jesus had said he would do are true. Listen to what he must do—what he will do. He is here to confront the powers and principalities that deal in fear, injustice, and hate. And it’s this—the voice of God that does them in. The disciples, the story says, are “overcome with fear.” And who could blame them, really? They’ve climbed up this mountain with their teacher, no doubt a grueling feat in itself. It would have been enough to see him transformed and aglow before their eyes. It would have even been enough to stand in the presence of Moses and Elijah. All these things would have been enough to send any one of us stammering, shuddering, wilting in fear. And then heaven itself descends even closer than it already seemed. What does this story have to do with us—this miraculous, mysterious story filled with light and sound and transformation? When I first read these verses, I sighed. This is just a little too sci-fi for my taste. Why couldn’t I continue with the Sermon on the Mount—because loving our neighbors, and even loving our enemies sounds more plausible than a story of mysterious transformation. On the whole, I do not find Christians…sufficiently sensible of the conditions. Does anyone have the foggiest idea what sort of power we so blithely invoke? Or, as I suspect, does no one believe a word of it? The churches are children playing on the floor with their chemistry sets, mixing up a batch of TNT to kill a Sunday morning. It is madness to wear ladies’ straw hats and velvet hats to church; we should all be wearing crash helmets. Ushers should issue life preservers and signal flares; they should lash us to our pews. For the sleeping god may wake some day and take offense, or the waking god may draw us out to where we can never return. Why shouldn’t we believe in a God who transforms, who speaks, who dazzles? What has changed seems not so much that we have grown smarter than the story, but that we have stopped expecting the mystery and glory of God to actually manifest in our lives. We are caught up in ordinariness. Perhaps even trapped in our own fears. Fear is profoundly antithetical to the Gospel. Sure, the entire scripture narrative is replete with people—ordinary people—who stand, crawl, cower, duck and cover in fear. We are afraid of lots of things. Constant worry. But the Gospel is clear. The way of God is not one of fear. It is one of risk, yes, but the words that ring most clearly remind us—“fear not!” Perfect love casts out all fear. Do not be afraid. Many interpreters read the latter part of this story—the exchange between Peter, and well, the voice of God—as a grand indictment of all religious institutions, or institutions at all—seminaries, churches, even non-profits. These institutions, they claim, are our booths in which we wish to enclose ourselves, with Christ, and attempt to prolong our holy moments. But I also reel a little at this massively-critical reading. Certainly institutions have tendencies toward insulation. The cause though is not the building of the walls—it is in our staying inside of them. And moreover, believing we can—our ought to—keep Christ within our self-raised structures. Most often our walls become fortresses, protective structures to keep us safe, secure, trusting in what we can know for certain, what we can control. But these efforts are borne of fear. Not the riskiness of radical hospitality and dangerous grace that strikes through the heart of the Gospel. One of the ways this story fits within the entire Gospel is the indictment of a faith with fear as its foundation—and that is a message we so desperately need to hear in our communities, where policies, talking points, public opinion, even theologies are predicated on fear. Of other people. Of change. Of things we can neither predict nor control. Of losing something. We know—or we ought to know—that if we live in fear, there is no room to live in love. If we clutch our anxieties, there is no way to embrace hope. If we cower in worry, there is no room to welcome others in Christ’s name. The thing is, as Annie Dillard says, most of us, even if we are able to admit that love is greater than fear, we do not live that way. We may say we believe that God is more powerful than death, but how do we live that proclamation? If we really moved about the world carrying with us the audaciousness that love, does in fact, win, Dillard is right, we would come prepped with crash helmets. Life preservers. So this story is as much about the power of God…the challenge to believe in a God who can and does and will continue to amaze us. And it is also about the relinquishing of our fear, and the insistence on coming down from the mountain, changed, and renewed, risking all the countercultural grace and hospitality and love of Christ.